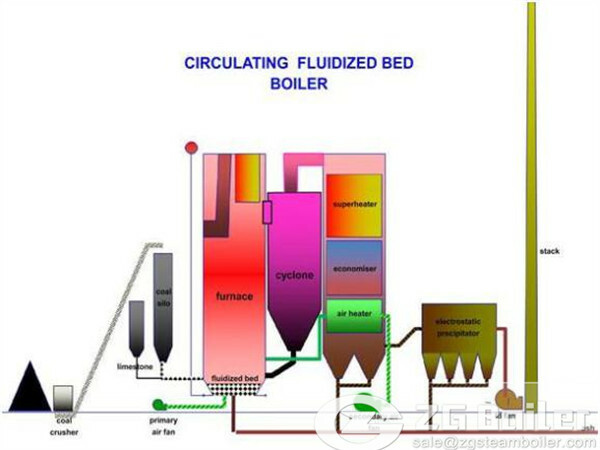 Circulating Fluidized Bed combustion is a comparatively new technology that has given boiler and power plant operators a greater flexibility in burning a wide range of fuels. How is this different from the more widely used Pulverized Coal Combustion? 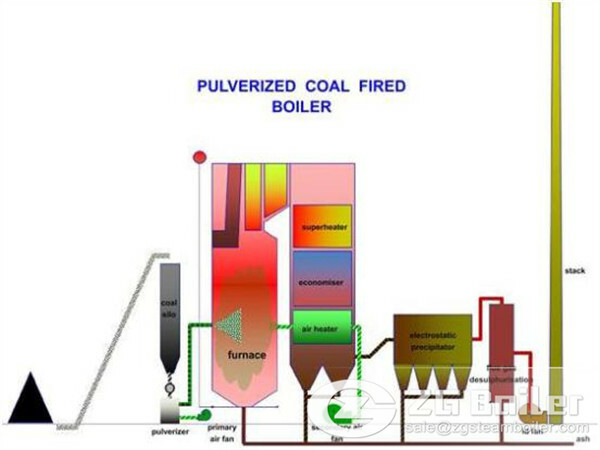 Most of the coal fired power plants use the Pulverized Coal (PC) firing technology. The technology is proven and is in use for nearly a century. Advances over the years have improved the efficiency of combustion, reliability and reduced emissions. The emerging technology of Circulating Fluidized Bed (CFB) combustion is different in many ways from PC combustion. The key differences are listed below. PC firing utilizes coal ground to a very fine powder sprayed into the furnace for combustion. CFB uses coal crushed to sizes of around 3 to 6 mm. The time energy and facility required to crush coal is much lesser than pulverizing coal. PC firing uses around 30 % of the combustion air as high pressure primary air for drying and transporting fuel. CFB uses higher pressure primary air which is 60 % of the combustion air for fluidizing. The total air for combustion and the balanced draught system is the same in both the systems. The furnace and the cyclones in the CFB boilers are subject to a lot of erosion due to the circulation of particles like ash and sand. To prevent this erosion a thin layer of refractory covers the lower half of the furnace, upper transition areas and the cyclone. PC fired boilers do not have refractory covering on the furnace tubes or other heat transfer areas. In a PC boiler a Flue Gas Desulphurization unit is required for the reduction of Sulphur Dioxide. In CFB boiler limestone addition in the furnace reduces the Sulphur Dioxide during combustion itself. This requires only a simple limestone storage and handling unit. In PC boilers around 15 % of ash collects at the bottom of the furnace and the balance in the electrostatic precipitators. In CFB boilers the collection at the bottom is almost 50 % lessening the load on the Electrostatic Precipitators. The water and steam circuit, the natural circulation of water and heat transfer surfaces are all the same in both the systems. The diagrams below indicate the overall difference between the CFB boiler and the PC boiler systems.